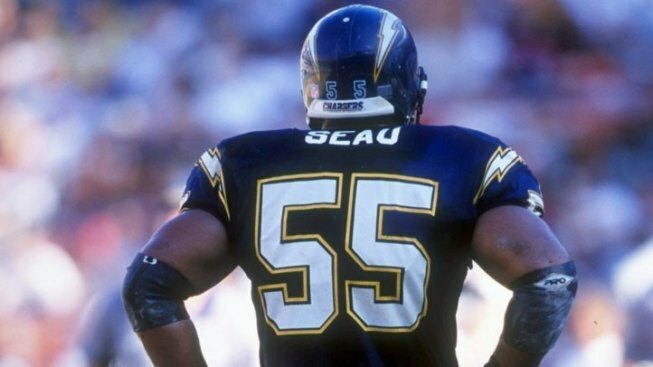 A prominent research center which has made strides in studying brain injuries in professional football players has asked a final favor of Junior Seau. According to Pro Football Talk, Boston University’s Center for Traumatic Encephalopathy wants to examine Seau’s brain for signs of degenerative disease. Seau, 43, was found dead inside his home Wednesday from an apparent self-inflicted gunshot wound, according to Oceanside police officials. The untimely death of the former San Diego Charger and NFL Pro Bowler reminds many sports fans of former NFL player Dave Duerson, who shot himself in a similar manner on February 17, 2011. Duerson sent his family a text message requesting that his brain be studied to determine whether the impacts he experienced on the field contributed to his depression. Researchers at Boston University’s Center for Traumatic Encephalopathy determined that Duerson did, in fact, show signs of Chronic Traumatic Encephalopathy, a progressive degenerative disease of the brain found in people with a history of repetitive brain trauma. The disease causes memory loss, confusion, impaired judgment, impulse control problems, aggression and eventually progressive dementia, according to the researchers. Regardless of whether Seau’s time on the field had any connection to his mental health, experts and supporters are talking about the risks of the kinds of impacts he experienced as a high school, college and professional football player whose career in the NFL spanned 19 years. The discussion comes at a time when lawsuits against the NFL are piling up, with former players accusing the league of not doing enough to detect concussions and brain injuries. PFT estimates there are about 1,500 plaintiffs in cases like these. However that’s not to say the NFL is standing by while its players get injured. A group of UCSD researchers recently received a grant from the NFL to look into some more preventative techniques for detecting brain images. They came up with a system called Magnetoencephalography, or MEG. The technique looks for Mild Traumatic Brain Injury. Other CT and MRI scans miss about 90 percent of Mild Traumatic Brain Injuries, which aren’t as severe as concussions, but still can cause life-long damage. Although Seau reportedly never experienced a concussion during his career, his wife Gina told the Associated Press he did. In any case, it’s possible that he experienced Mild Traumatic Brain Injuries, said Mingxiong Huang, UCSD Radiology professor. Using the MEG images, researchers compared the brain scans of a 27-year-old combat veteran who lived through an IED explosion with those of a 17-year-old football player. While the CT and MRI scans are negative for both the veteran and the football player, the MEG scans show similar areas damaged. “The [MEG] information can be used as guidance for sending the patient to specific therapy, depending on which region of the brain is damaged,” said Huang, who is also the Associate Director of the MEG Center at UCSD. Each MEG system costs about $2 million, so there are only about 20 in medical centers around the country. But it’s non-invasive, Huang said, so providing the imaging for high school, college and professional football players could dramatically change the long-term health of football players. For more on the life and legacy of Junior Seau, click here for all related stories.